The Charlotte Gateway Steering Committee (CGSC) is a governance board that guides the development of the future Charlotte Gateway District project and its selected private development partner. The CGSC is comprised of representatives from CATS, the City of Charlotte, the North Carolina Department of Transportation and regional economic development stakeholders. 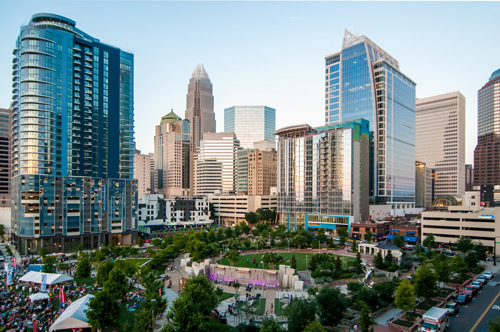 March 20, 2019 10:30 a.m. – 12:00 p.m.
February 20, 2019 10:30 a.m. – 12:00 p.m.
City of Charlotte Incorporated in 1768, Charlotte is often referred to as the “Queen City.” As the most populous city in North Carolina, Charlotte has reached over 800 thousand residents and continues its mission to be a remarkable place to live, work and visit. CATS The Charlotte Area Transit System (CATS) is the largest transit system between Atlanta, GA and Washington, DC with over 70 local, express, and regional bus routes, a light rail line, streetcar service, services for the disabled as well as vanpools. Mecklenburg County Mecklenburg County, which is located in the southwestern part of the state of North Carolina, serves over 1 million residents in the communities of Charlotte, Cornelius, Davidson, Huntersville, Matthews, Mint Hill and Pineville. N.C. Department of Transportation One of the state’s largest agencies, the North Carolina Department of Transportation is responsible for maintaining roadway systems across the state as well as regulating and implementing programs to support rail, aviation, ferry, public transit and bicycle and pedestrian transportation. Charlotte Center City Partners Charlotte Center City Partners facilitates and promotes the economic, cultural and residential development of the City’s urban core. Register below and stay up-to-date on the Charlotte Gateway District Development Program. Announcements will be emailed as new information becomes available.